I would like to take you back to the very first winner of the classic treble, comprising the 2,000 Guineas, the Derby and the St Leger. ‘THE WEST’, as he was known on the racecourse, was at the time, heralded as the best horse of the 19th century. Owned and bred by John Bowes, he was by Melbourne, sire of the winners of 11 Classic races including Blink Bonny (1857 Derby and Oaks), out of Mowerina by Touchstone. John Bowes was the son of the Earl and Countess of Strathmore, but as he was born nine years before their marriage he never succeeded to the title. Nevertheless, he became a member of the Jockey Club and a successful industrialist, developing a shipping line in Newcastle and a coal vein discovered on his estate. 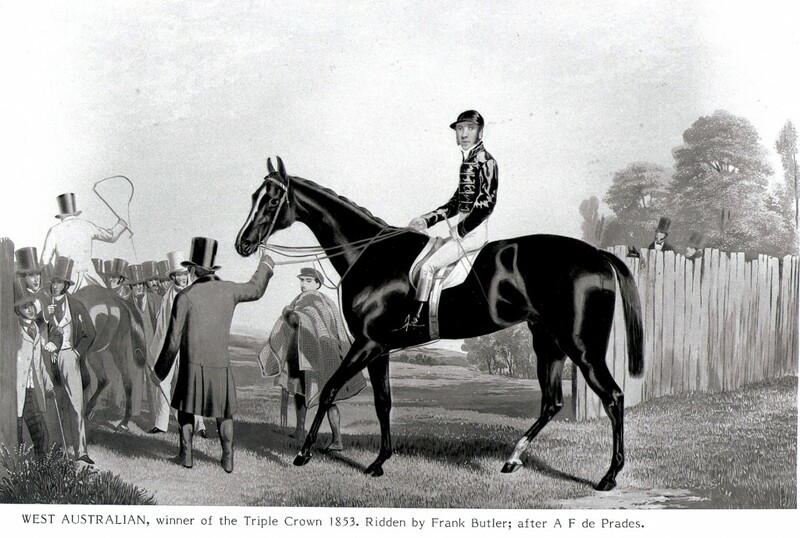 He also owned and bred three other Derby winners – Mundig (1835), Cotherstone (1843) and Daniel O’Rourke (1852). West Australian stood 15.3½ hands, and was described as a yellowish bay, rather long in the body, with good shoulders and great depth of girth. Sent as a yearling to John Scott’s illustrious Whitewall stable at Malton, West Australian was found to have a weakness in his feet and ankles, and his debut had to be delayed until the Newmarket Houghton Meeting. Here he ran second, beaten half a length by Speed the Plough, in the Criterion Stakes. This was to be his only defeat and three days later he reversed the form in the Glasgow Stakes, winning by two lengths. Before the colt’s racing debut Scott had tried him in early August, with Longbow, a three-year-old who was to win the Stewards’ Cup the following year with 9st 9lb. In the trial Longbow, ridden by Frank Butler, gave the two-year-old the standard 21lb but West Australian, with Sam Templeman up, won very easily. After the trial Scott caught the London Express, and early next morning visited London’s biggest bookmaker, ‘Leviathan’ Davis to take £30,000 to £1,000 (approximately £1,650,000 to £55,000 today), about West Australian winning the Derby. The following year West Australian’s first outing was in the Two Thousand Guineas. Starting 4-6 favourite, he beat the Duke of Bedford’s Sittingbourne by half a length. Soon after, rather than submit ‘The West’ to the long and arduous train journey from Yorkshire to Epsom a day or two before the Derby, Scott took him to nearby Leatherhead a week before the race and, as a precaution, lined his box with clay to protect his feet from overheating and the risk of infection. On Derby Day, 28 runners went to post and after a ding-dong struggle throughout the last furlong, West Australian courageously held off the challenge of Sittingbourne by a neck, with Cineas a head away third. “Leviathan” Davis did settle up, but only just, and he was forced to go to Ascot with barely £200 in his satchel. Fortunately, his luck turned and he won £12,000 on the first day. In the St Leger, despite plots, counter plots and a horse Cat’spaw, entered with the sole purpose of bringing down the favourite, West Australian won in a canter, while Sittingbourne, well backed to reverse the form, failed to stay. Thus West Australian became the first horse to win the Triple Crown, although the title was not generally coined until the 1870’s. At Doncaster, two days after his St Leger victory, West Australian walked-over for a sweepstakes and at Newmarket two weeks later, he was unopposed for the Grand Duke Michael Stakes. As a four-year-old he won an Ascot Triennial, beating Vanderdecken by four lengths, took the Ascot Gold Cup by a head, after a determined battle with Kingston, and finally, won a three-runner sweepstakes at Goodwood by 20 lengths. Bowes then sold him for £4,600 to Lord Londesborough, who stood him at Kirkby Farm, Tadcaster, at 30 guineas. On the death of Lord Londesborough in 1860, West Australian was resold for 4,000 guineas to the Duc de Morny, before finally passing into the hands of Emperor Napoleon III. Although West Australian sired two Classic winners – Summerside (1859 Oaks) and The Wizard (1860 Two Thousand Guineas) – his long time influence on the breed came from Australian (ch.c. 1858), sire of Spendthrift (1879 Belmont Stakes), and Solon (b.c. 1861), sire of Barcaldine. Australian was sent as a weanling, with his dam, to Scott County, Kentucky, in 1858. He is the maternal grandsire of Iroquois (1881 Derby). West Australian died in France on 2 May, 1870.